I’m excited about a new development on my stem cell book. It should be available on Amazon in E-book form in 2 days on Friday, September 27th for $22. It looks like you can already get the E-book on the publisher’s site here today. 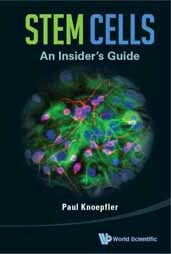 I wrote my book on stem cells (Stem Cells: An Insider’s Guide) because I judged that I could boost the impact of my educational outreach efforts via going beyond my blog to include a book. I figured that a book could have a broader, different kind of audience. To the best of my knowledge, I have very little potential to make any money off of this book even if it is very successful and I knew that was almost certainly going to be the case going into this so I didn’t go into the project to make money. Instead, I find writing and interacting with the wide audience of people interested in stem cells to be rewarding. If the book does make me an decent sum of money, a good chunk of that will be going from me to charity, stem cell outreach, or research. It took me about a year to write this book once I had made the deal with the publisher, although some sections I had written earlier in draft form as I had been thinking about writing a book for a few years. Some sections also are inspired by or actually have some material from this blog as well. In the end now that I can look at the project I have to confess it was a heck of a lot more work than I ever imagined. It’s about 365 pages long…just about one page for each day in the year. I really don’t know how I got it done, but I can tell it involved a lot of sleep deprivation and weekends devoted to writing. I think my family was about ready to take away my laptop at some points I was so focused on the book. If you order the book now through the publisher here you can still get it for 30% off the cover price. If you order it through Amazon here with the Amazon built-in discount and free shipping it is not that different than the publisher price. Even with no discount the book is affordably priced at $29 and that price was an important issue to me. Once you read it please let me know what you think. My prediction is that the book will surprise you in many ways. It may even upset some of my supporters on some fronts and please some of my critics on other points. Overall I hope it gets people talking about the most important issues and talking with each other.